WordPress vs. Wix Part 1: What User Interface Is Best? When we first started our company, we offered WordPress frameworks as our exclusive design and development solution. In the past year, we have accepted several projects on the Wix platform. As with anything online, there are advantages and disadvantages to both. To accurately give you the best comparison, we have divided the conversation into categories and there is one category per blog post. So we will start our pros and cons between WordPress and Wix to help you decide what works best for your website. Today’s topic is the user interface, or development area of your website. WordPress: While there are many frameworks (we prefer Genesis) and subsequent child themes to choose from, the basic WordPress interface is pretty user-friendly. A user who simply wants to publish frequent blog posts with images won’t have much trouble. However, if you’re going to develop and design your own site, you’ll probably need to read some tutorials about how certain tools such as menus, widgets, slideshows, etc. are used. And if you need specific customization, you’re going to need to know a little CSS to get by. You should also note the difference in the images on the right. 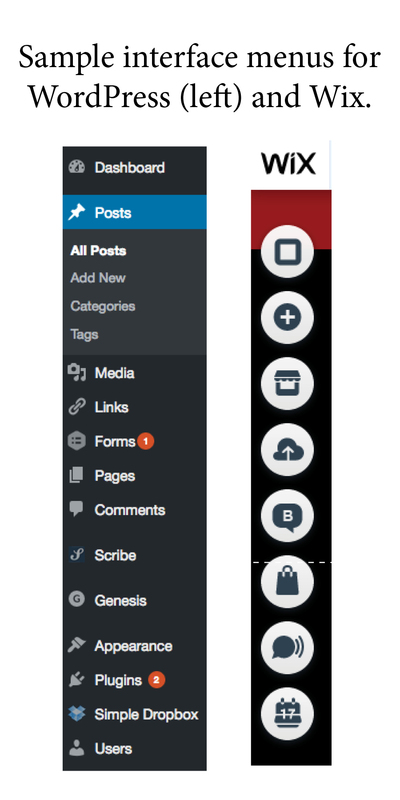 The WordPress default interface is word-based while Wix relies on icons. But if you scroll all the way to the bottom of a WordPress site (in development mode) and click on the “collapse menu” option, the menu interface becomes icon-based similar to Wix. Wix: This platform is definitely for the drag and drop designer. At first glance, it seems pretty simple. Pick a theme and then start replacing text and images with your own content. Need a button or a form? There’s a pre-made menu where you can choose elements from a design gallery. (That’s not so with WordPress.) We also like the guides provided that allow you to line elements up almost exactly. Wix is very free form. It’s easy to customize and move elements around. However, as simple as it may be, we’ve found it to be a slow moving interface. And site development gets slower as you add more elements. If your site is complicated, you might find Wix to be a bit frustrating unless you’re willing to trade speed for a lot of easy creative freedom. We still think you should watch these Wix tutorials if you’re going to go out on your own though. Overall Recommendation: For a simple blogging or résumé site, use Wix. For a more powerful, in-depth business site, use WordPress. Our next WordPress vs. Wix blog post will focus on themes and variety. behind WordPress and Wix? Contact us using the form below! Tell us about your project, ask a question or leave a comment!